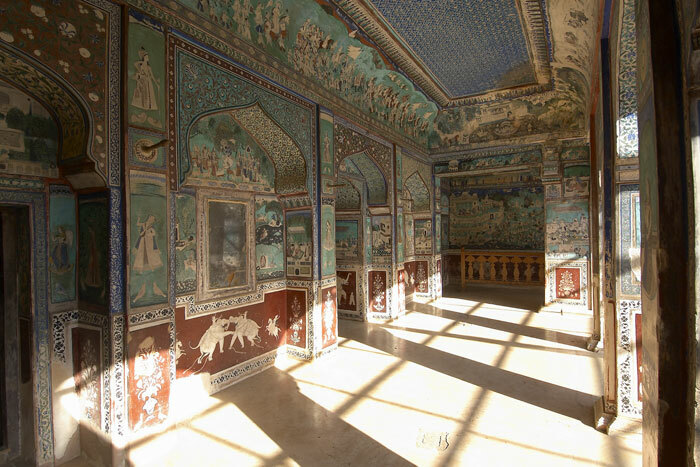 Bundi is one of the few places in India, which can lay its claim to an authentic School of Painting. "The Bundi School" is an important school of the Rajasthani style of Indian miniature painting that lasted from the 17th to the end of the 19th century in this princely state. One of the earliest examples of the Bundi Paintings is the Chunar Ragamala painted in 1561. Bundi paintings emphasized on hunting, court scenes, festivals, processions, life of nobles, lovers, animals, birds and scenes from Lord Krishna's life. The Bundi School had a close association with the Mughal style yet it was never fundamental to the evolution and growth of Bundi paintings, however the delicacy of the Mughal style was also not abandoned. The Chitrashala, which is also known as the Ummed Mahal, is a part of the Garh Palace. It was built in the 18th Century, and forms a set of rooms on an elevated podium above the garden courtyard. The famous Chitra Shala in Bundi provides a colourful glimpse of history. The walls, ceiling of this palace are completely covered with paintings of the Bundi school which are still in very good condition. These splendid paintings in the Chitrashala are par excellence and can be compared with probably the best anywhere in the world. At The Hadoti Palace we will arrange for local artists who will facilitate, educate and teach our esteemed guests to paint in the authentic Bundi style. Our guests can take these paintings back home as souvenirs created by themselves.